In 2012 when my beloved, yet significantly overweight, boyfriend passed away suddenly I vowed that I was going to get my significantly overweight self into shape and run a marathon some day in his honor. I struggled through the next year losing weight, grieving, and running. Yet, no matter how much running I did, it never brought him back to me. Broken by a deep depression and the realization of a significant and permanent loss I began to regain weight and I lost my desire to run. In 2016 I decided that I was ready to run again. I visited the orthopedic surgeon who said that due to a previous knee injury that I would be a perfect candidate for a knee replacement if I was 15-20 years older but at my current age he sent me to physical therapy and when I asked about running he said that I would never run again. I was truly devastated. I returned to work (school) the next day and our Occupational Therapist was playing a video of the story of Pete the Cat and his White Shoes. 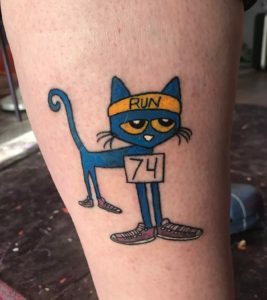 In this story, Pete the Cat overcomes many obstacles and the moral of his story is that “No matter what you step in, keep walking along and singing your song because it’s all good.” I realized that, as silly as it sounds, that I could be like Pete the Cat and that even though I couldn’t run that my life was still all good. Several months later when physical therapy had made my knee worse I returned to see my doctor. I hesitantly broached the subject of running again. This time he said that I could try it, but to take it easy at first. Since that day, I started running and never looked back again. My first “official” event was a 1 mile walk in January. I had planned to do the 5K race, but it was 7 degrees outside and I was slow and didn’t want to freeze! Next up I had another cold event in March, a St. Patrick’s Day 5K where it was 26 degrees. This time I was determined and completed my race! It was one of the best and most triumphant feelings ever to complete a 5K after being told I’d never run again. After this I did a few more 5K races here and there, but seeing as Akron is my hometown, I had my sights set on the Akron Children’s Marathon Race Series. I entered the 8K and was beyond excited to have completed it and received my medal. I heard about the medal for finishing all three events in the series and I knew that this was something that would become very important to me. (Just ask anyone who knows me well – running these races is all that I’ve been talking about!) Realistically, though, I knew that I wouldn’t be in the shape that I needed to be to complete a half marathon by September. 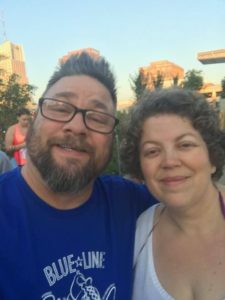 So, I contacted the Akron Marathon people inquiring about relay teams and they sent me to Paula and the Blue Line Beginners. While I wasn’t exactly a beginner, and even though it was already midsummer, they took me in as one of their own. And I am so glad that they did. I was so nervous showing up the morning of the 10K and meeting the group, but everyone was so friendly! Since then I’ve enjoyed all of the times that I’ve been able to join the group. I’m especially grateful to have become a member of a relay team which brings me to the actual subject of this story!! The day of the marathon was probably my favorite day so far this year. There are several reasons for this not the least of which is that my wonderful husband who is an over the road truck driver was able to arrange his schedule so that he could be home and spend the day at the race with me. It was also one of the most worrisome days of the year so far, too. Earlier in the week it had been necessary to run after a student down the hall. As I’d been running, something in my favorite knee popped. I was so, so worried that I wasn’t going to be able to run and that I’d let my teammates down. But, I iced it and took as good of care of it as I could, and just hoped for the best. Since we live in New Philadelphia, we had to get up at 4 a.m. in order make it to Akron in time to park and get ready for the race. As usual, I was very nervous about making it there on time. Once we got to the parking area and met up with the other BLB members, I felt much better. Since I was running the second leg of the relay, we were able to watch the start of the race. I was so excited to be there that I was nearly crying as I cheered for the starting runners. After the race started we walked up to where leg 2 began. We waited anxiously with all of the other runners for Heidi’s smiling face to appear. Then I took off and decided that I was going to just walk as fast as I could because I didn’t want to upset my knee. One mile into my run, so far so good and I was making pretty good time, so I decided to keep walking fast and run a little here and there. This strategy worked well for me and I continued through the end of my leg and actually managed to improve my 10K pace per mile by about 45 seconds. I was very glad that I’d joined other BLB members for the practice run so that I knew what to expect. I think it was definitely easier to enjoy myself this way. I loved the Hero Zones and all of the enthusiasm that they generated. I also appreciated the block parties, especially in Firestone Park. I think one of the greatest things about being a runner is the frequent encouragement that you receive from other runners while you’re out on the road and this race was certainly no exception. As a BLB member, when other folks saw my blue wristband, they were even more encouraging. My favorite part of the race was at the end of my leg when my husband was there in his BLB shirt cheering me on as I handed off the bracelet to Leslie. Afterwards we cheered on the half marathon folks that were coming through and then walked down to Canal Park. I received my series medal and my food and went off to find my husband. Perhaps my only regret for the day was that at this point I became somewhat overwhelmed and sick from the heat and we decided that it was best if we left early instead of staying to wait for my last team member to cross the finish line. I’m already planning my strategy for next year. I intend to run all three races again, but I plan on doing the half marathon in September. In 2019 or 2020 I intend to run that marathon not only in honor of my late boyfriend, but in celebration of the person that I am now and the person that I’m working on becoming everyday. I am so grateful for the support that I’ve received from the Blue Line Beginners that has indeed gotten me one step closer to that day. ← You’re almost there, Jim!